The Scentsy Silhouette Collection is no longer available. 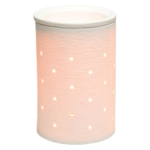 Please visit HERE for a list of our current Scentsy Warmers. Scentsy Silhouette Collection includes our fun, interchangeable Scentsy Warmer Wraps. 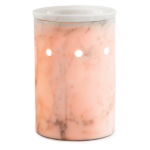 Encircle Etched Core Scentsy Warmer or Carrara Scentsy Warmer with one of our Wraps, switch on the warmer, and watch the light shine through as it creates amazing, textured patterns. Switch out your Wrap with one of our seasonal holiday wraps (included in our Harvest Brochure and our Holiday Brochure). With our Scentsy Silhouette Collection, simply add 4-5 cubes of fragrant Scentsy Wax, and enjoy the personalized look and fragrance.